In this closeup, partially out of focus, we can see the sandstone nature of the rock. We can also see the black specks in the rock which are the lithic fragments. Feldspar is also present but harder to distinguish from the quartz. 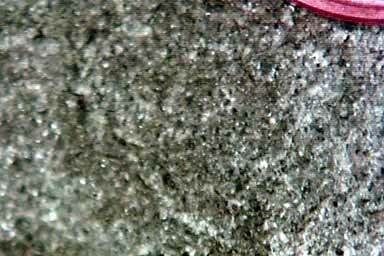 It is harder to see the wacke nature (matrix in which the sand grains are imbedded) without getting the specimen under a microscope and rotating it around. What we would observe is that the sand grains appear imbedded in a matrix, like islands standing up out of the sea. This is in contrast to a rock with little or no matrix where it is possible to see the grains contact each other along their sides.